There have been challenges to be sure for the Lakeridge boys basketball team this year. After the conclusion of play on Monday, the Pacers sat at 0-4 in Three Rivers League play and just 1-13 overall. But the biggest thing in the Pacers' way this year isn't lack of talent or familiarity — it's this: Jefferson, West Salem, North Medford, Lake Oswego, Oregon City, Tualatin, Tigard, Barlow and Grant. All those are teams with wins over the Pacers, all are top-22 teams in the OSAA power rankings, but all are also teams that are helping make Lakeridge better. The Pacers got their latest lesson on Monday in the MLK Invitational, falling 100-59 to Grant, the second-ranked team in the latest Class 6A coaches poll and No. 3 in the OSAA power rankings. And while the final score wasn't close, the Pacers hung with the Generals for the first 14 minutes of the contest, trailing by just eight points until late in the first half. Grant then used a 54-27 edge in the second half to leave the Pacers far behind. "We just have to work hard," said Lakeridge senior John Struik, who had four points on 2 of 3 shooting from the floor. "No matter what happens the whole game, you've got to use whatever you've got to get better, every minute." "We were able to get some easy buckets, ... we were getting rebounds and we were able to get out in transition and get the shots we wanted and I think that's what brought us back," said Lakeridge senior Jake Fedrizzi, who went 6 of 13 shooting en route to his 14 points. "And our solid defense obviously kept them from scoring as much. I think that's what kept us in it toward the end of the first half." The Generals — led by Aaron Deloney's 31 points and seven assists, and another 24 points from Kelton Samore — started fast, dropping a 29-18 first quarter on the Pacers at the start of their game. 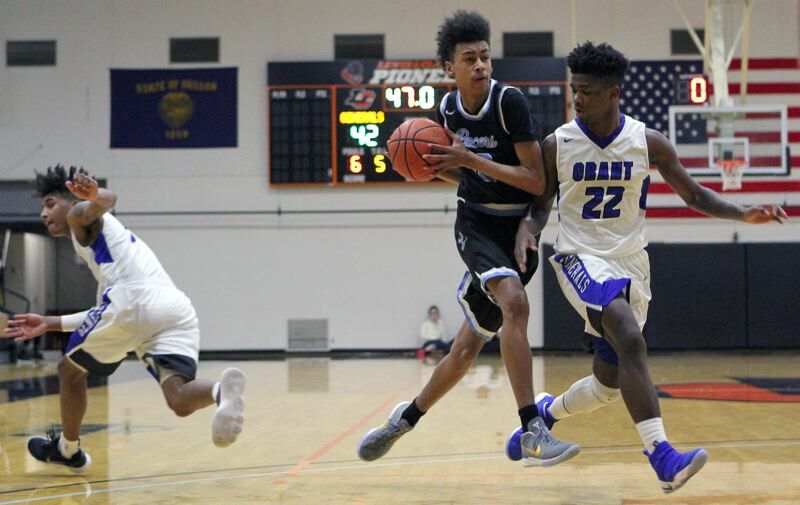 Things got worse before they got better, too, with Grant extending its lead to 16 points in the second quarter, the last time at 40-24 when Deloney scored on the fast break with 3:02 remaining in the first half. But the Pacers responded with their best stretch of the contest, scoring eight straight points in a span of just 2:28 that cut the Generals' lead to 40-32 with 1:21 left in the first half. That run started with a low-post basket from Cort Gerot assisted by Lawrence Chen, continued with a Chen pullup from the left baseline, a floating jumpshot in the key from Tony Fair, and a steal and breakaway hoop by Fedrizzi. "I think our defense stepped up in that last couple of minutes," Fedrizzi said. "It was a reasonable margin that we could definitely come back from." "You just have to match them," Struik said. "You have to be playing as hard, if not harder, than them, just doing everything you can." Grant, however, responded with force, ending the half with six straight points — three each by Samore and Deloney — to lead 46-32 at the half. Then, the Generals tacked on a 26-14 margin in the third quarter to extend their lead to 72-46 and essentially put the game on ice. Deloney did most of the damage there, hitting two 3-pointers and scoring eight points in the frame. For the game, junior Matt Armsby hit 6 of 13 shots from the field and 3 of 4 foul shots to lead Lakeridge with 15 points and two steals. Also in double figures for Grant were Darius Guinn with 15 and Ty Rankin with 10.